On the occasion of the 16th International Architecture Exhibition, La Biennale di Venezia, and Marignana Arte will open a new exhibition curated by Ilaria Bignotti. 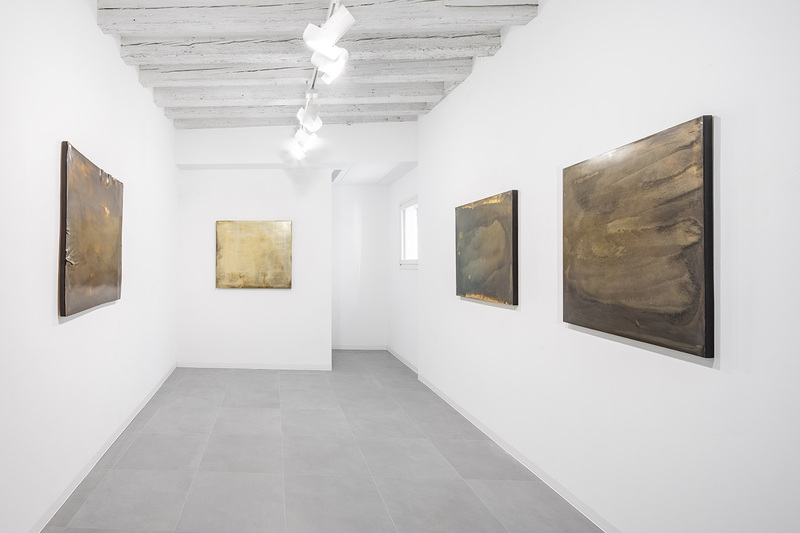 The theme is strongly aligned with both the identity of the gallery and the curatorial orientation of Ilaria Bignotti. Ilaria is a researcher in spatialism and environmental languages between the sixties and seventies, and also in contemporary exploration, with reference to the themes of processuality, resilence, and site-specificity. These themes of the project are reflected even by the title that is a play on words on “two tracks.” On one side, if the reader takes the words’ initials w.w.w., they are sent directly on line, to the net, to the digital world that celebrates the potential of the collective involvement used in the artwork and the immersive experience. 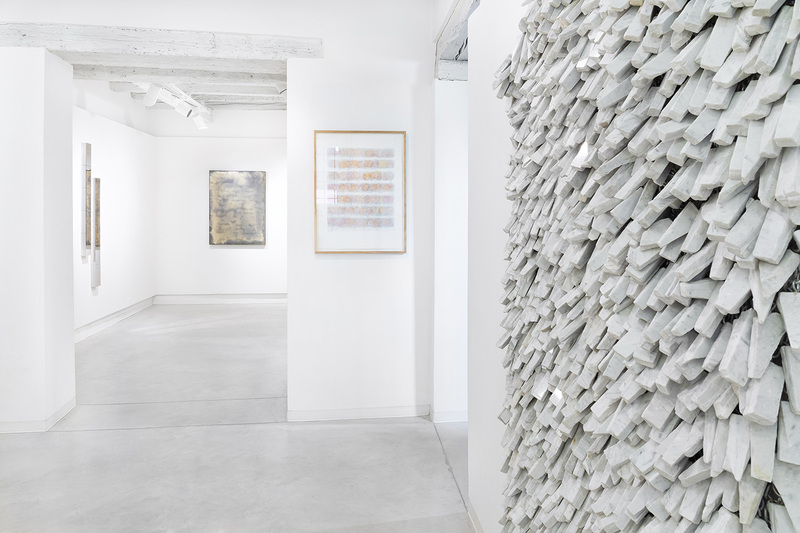 On the other hand, reading the title of the exhibition in its extension, it asks us, and foremost the artist, “What do walls want?” or rather how does the artwork fit in with the space around it, intended as how the surfaces welcome the image, how the osmotic walls of a metaphysical vision and also like an osmotic membrane, activate the exchange among artwork, artist, and spectator. The artists involved in the project, many welcomed to Marignana Arte gallery for the first time, reply with autonomous research while talking to each other via the selected artwork. One of the names that stands out is Antonio Scaccabarozzi, who sadly, passed away in 2008. He was and is a member of the conceptual season and the analytical Europe; a rigorous representative of a pure and contemporary pictorial style, yet to be discovered within his profound legacy. 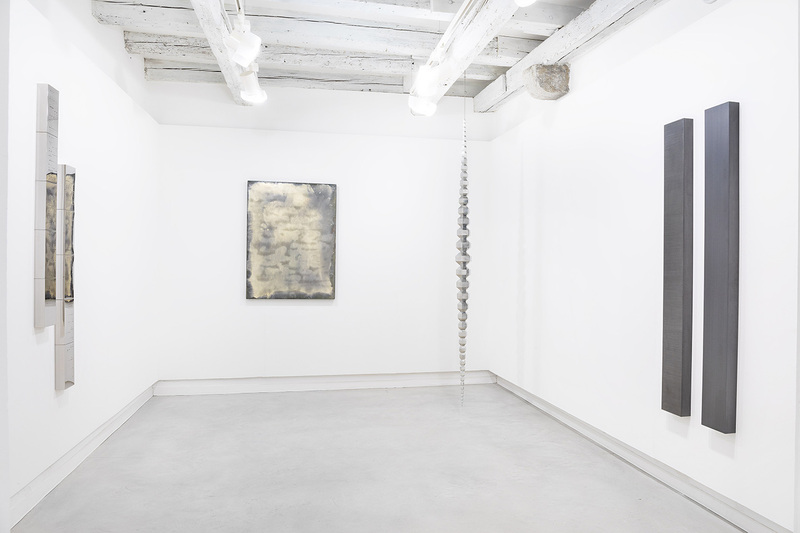 Another name is Roy Thurston, a leader in analytical America, with his totemic painting, bewitching, conceptual and metaphysical, made of slow repetition of metallic souls playing on the walls in an unsettling and hypnotic dialogue. Nancy Genn is also a revered American artist, from California. Her artwork is an osmotic process of organic power. 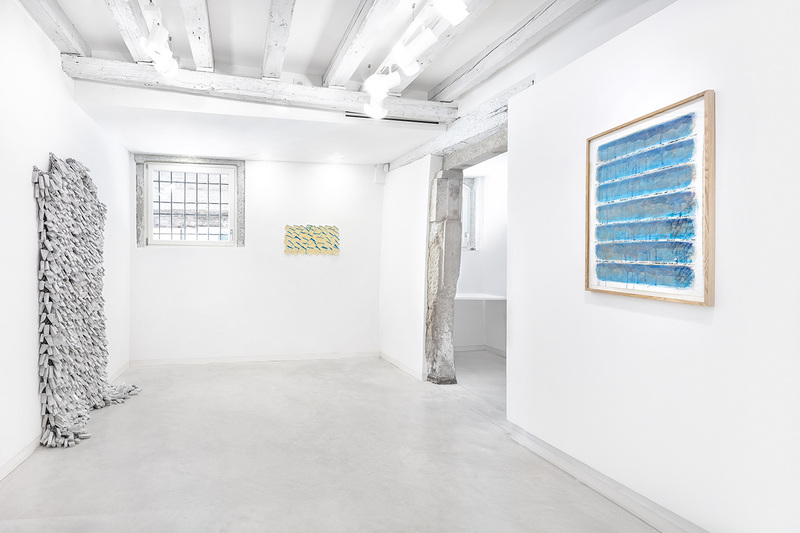 A comprehensive show of her work curated by Francesca Valente is showcased at Palazzo Ferro Fini until August 7. Returning to exhibit in the gallery is Alessandro Diaz de Santillana, with his work of absorbing mystery. The relationship between surface and depth and duly create dialogue with each other. Riccardo De Marchi is an artist of refined poetry seeking an analysis of the relationship between the surface and its potential of artistic activity that goes beyond ordinary vision. Mats Bergquist is a Swedish artist whose project is enriched by a precious and refined research that expresses itself in pastic forms, both concave and convex, heirs of ancient rituals between man and space. 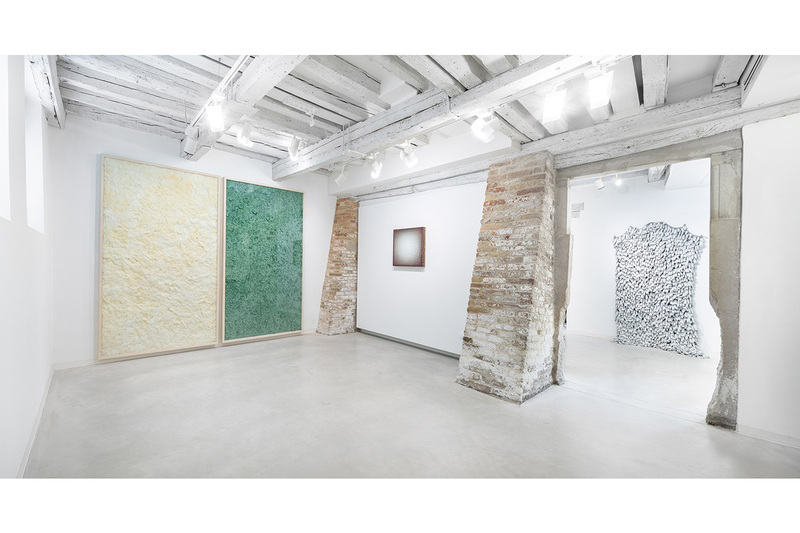 The arwork by Silvia Infranco, a young artist from Bologna, enjoys an active dialogue with Bergquist’s work, thanks to the use of organic materials such as wood, water, paper, and wax. They emerge from the walls with an ancient presence, malleable witnesses to our nervous gaze between past and present. Alberto Gianfreda and Serena “shatter” the certainties of their artwork as two-dimensional objects, the former bending the sculptural and iconic laws and the latter teasing, in a conceptual way, the severity of the image. Demineralization of the defined rapport between the surface and the ground, between field and vision, resides with the American artist Emil Lukas, an advocate of a vibrant weave that creates light, between density and emergency, in an exceptional work of art; while Brazilian artist Artur Lescher, measures the bond between man and space that solidifies in iconic objects precise, with an extraordinary tidiness. 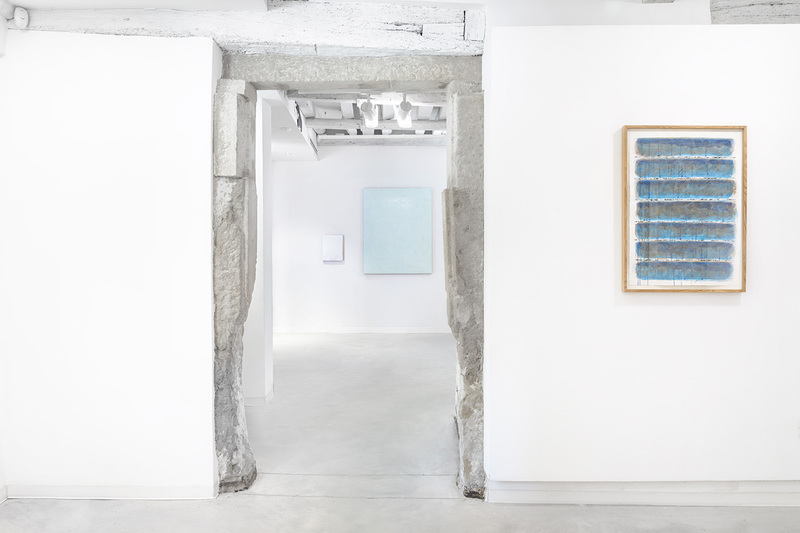 Continuing with exhibitions with experimental themes, the ‘Project Room’ at Marignana Arte gallery, is a perfectly designed space to welcome the artwork of Alessandro Diaz de Santillana. Over the past decades, the artist has studied the ancient techniques of the Venini glass dynasty, which was founded in Murano in 1921 by his grandfather, Paolo Venini. Alessandro Diaz de Santillana has gone on to widen and enrich his own knowledge of the complex techniques of glass work, to “forget by heart” and translate those techniques in a lyrical and conceptual language of great intensity. As the exhibition title suggests, quoting the thoughts of Hugo Von Hofmannsthal, the patina of the past merges with the present spark of Alessandro Diaz de Santillana’s work, which in turn dives into and mixes with the cloudy mystery of the future. Diaz de Santillana’s artwork reworks the ancient technique of flat glass window production, where, a large blown cylinder, once cooled, has its ends removed and is cut lengthwise. The cylinder is then reheated and unrolled forming a flat slab of glass on which the artist acts immediately and instinctively, working, shaping and moulding the glass into its final shape. A film is then applied on the transparent glass making the artwork dense and absorbing, inscrutable and volatile. The result is a material-forward piece that is compact and powerful, imposing itself on its surroundings – the opposite of the fragile and ethereal image of glass. By giving up on its reflective properties, Alessandro’s works become symbols that seem to protect an ancient and dormant brilliance, as if they held unsolved secrets, unveiled mysteries. On the surface of every work, the eye inevitably sinks in an unsettling elsewhere, then, as soon as an image seems to appear, it’s already luring us back to its deepest depths. If this is the emotional and suggestive impact of Alessandro Diaz de Santillana’s artwork, the denial of the reflectance and the emergence of the lyrically abstract forms of the surfaces puts him in dialogue with the generations that, ever since the sixties, have undertaken a visual research aimed at overcoming the two-dimensionality of object-artwork. In a conceptual and metaphysical direction by investigating the mystery of vision and reputation in a moulded and involving rapport with the onlooker, the spectator, is given the responsibility – and the wonder – of the choice and the aesthetic discovery through an unpredictable occurrence of depth on the surface. Taking this all into account, the relationship between the artwork in What Walls Want and the Project Room dedicated to Alessandro Diaz de Santillana becomes evident. Marignana Arte has once again created the opportunity for dialogue between the art and the viewer.